When using the Results Analytics reporting feature, you have the option to filter your report results by Form Responses. 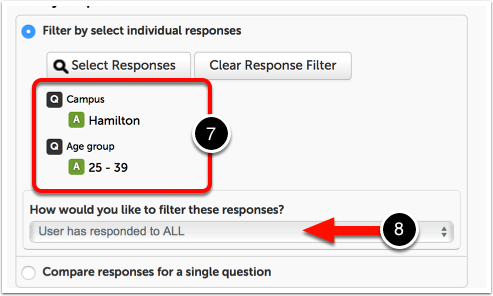 You can select to filter by select individual responses or by comparing responses for a single question. You can filter your report results by form data while setting up the report parameters or after generating a report. Do you want to filter Assessment Instrument or Outcome Set data by form responses? It is strongly recommended that you use either the Single or Multiple Choice question type when creating the form. This will ensure that your report results are accurate and include all associated responses. 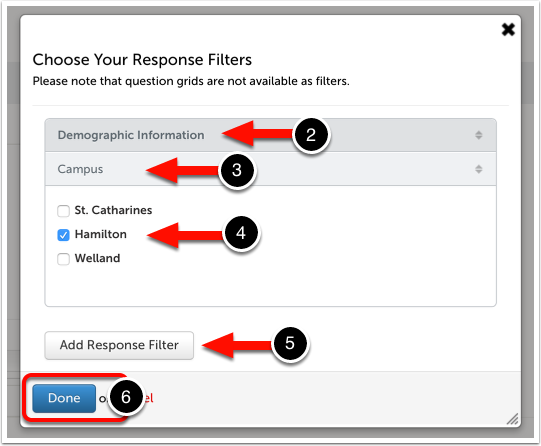 There are two methods for filtering report results by form responses. 1. Leave selected the default option of Filter by welect individual responses. Click on the Select Responses button. 2. Using the first drop-down menu, select the survey that contains the responses you would like to filter by. 3. Using the second drop-down menu, select the question from within the survey that you would like to filter by. 4. Select the Response(s) by using the checkbox(es). 5. 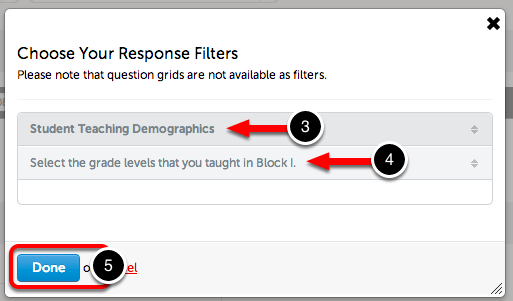 If you would like to add another demographic filter, click on the Add Response Filter button and repeat steps 2 through 4. 7. The response(s) that you selected in the previous step will be displayed. All responses were selected simultaneously: This option allows you to optionally select the time frame for when the responses were collected. If this option is selected, the respondent must have responded to all of the appropriate filters in the same form response. If deselected, the respondent may have responded to all of the appropriate filters in multiple form responses. 9. Click on the Generate Report button. 1. Select the Compare responses for a single question option. 2. Click on the Select a Question button. 3. Using the first drop-down menu, select the survey that contains the responses you would like to filter by. 4. Using the second drop-down menu, select the question from within the survey that you would like to filter by. 6. Click on the Generate Report button. After you have generated or updated the report, and regardless of which method you used, you can drill down into the report. To learn more, visit the Drill into Sub-Reports help page. If your report is comparing multipe time intervals, you can do statistical significance testing between two or more groups using the Chi Square test. To learn more, visit the Progress-Over-Time Reports with Chi Square help page.